The deliciously sweet and spicy aroma of your Asian takeout meal is definitely making you anxious to dig in to dinner. And a bottle of wine would make it even better-but is it hard to find a match? 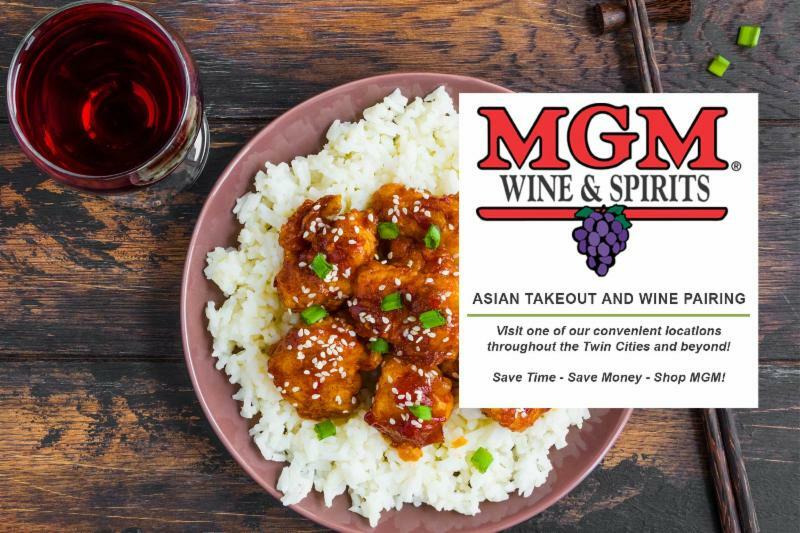 With an array of complex flavors including sweet, spicy, sour, bitter and salty, you may tend to think Asian food is difficult to pair with wine. But whether it’s steamed dumplings dipped in savory sauce, sweet and sour chicken, or fiery Sichuan beef, there is a perfect wine pairing for every Asian dish. Just keep a few basics in mind, and you can uncork some winning combinations. Wines should emphasize a balance of taste sensations rather than overpower. Tannins in wine-that dry, sometimes puckery sensation in your mouth-can clash with the salt and spice of Asian food, and also intensify the heat sensation of a dish’s spices. So you’ll want to select wines with low tannins. In general, a light to medium-bodied white wine that is dry to semidry is the best choice with Asian food. And the slightly sweet tastes in the wine are a nice contrast to both the salty and sweet flavors in the food. Chenin Blanc: Pairs well with citrus-flavored dishes. Gewürztraminer is a good bet with spicy dishes. Grüner Veltliner: Flavors in Japanese cuisine tend to include bitter and vinegar-based ingredients. With its fruity aroma and light pepper flinty character, this Austrian wine can match with those flavors and seafood dishes. Riesling‘s natural sugar/acid balance is a classic Asian food pairing and very compatible with the hot, sour, salty and sweet elements of the dishes. The range of dry to sweet Riesling can match all types of Asian cuisine because it is fresh, fruity and never too heavy. The medium body and high acidity can balance the sugar, salt, and even the slight pickled flavor of such ingredients as bamboo shoots. A semisweet Riesling can stand up to spicy, more complex dishes such as Kung Pao chicken. Sauvignon Blanc‘s dry, fruity yet herbaceous and grassy hay-like character enhances the lemon, cilantro and mint flavors in lemongrass chicken-the complex combination of flavors includes some fish sauce, which adds a briny character to the fruity lemon and savory chicken. It can complement the strong seasonings in Chinese food including ginger, garlic and soy sauce. Pouilly-Fumé’s slight smokiness and acidity balance saltiness and oiliness in a fish and soy sauce dish. With the spicy, hot flavors of Sichuan dishes, high acidity can be refreshing. Sparkling: Try champagne or a fruity Spanish Cava with sushi; they can pair well with wasabi and the bubbles cleanse the palate for the next bite. If you like rosé, it can be a good option with roast pork dishes as well as sweet and sour pork or pan-fried pork and dumplings. For fans of red wine, there are some dishes, especially those made with beef, which can stand up to these wines. Beaujolais‘ fruity flavors can work with the spicier meat dishes. Merlot‘s fruity flavors plays well with the soy sauce in a beef stir-fry. Syrah/Shiraz tends to pair well with teriyaki-style beef and grilled sweet and spicy beef. The heavy garlic and smoky sweet mix of spices in Korean food can pair with peppery Aussie Shiraz. Zinfandel has the tannins and spice to handle the fat and char flavor of Asian barbecued ribs coated in a sweet/spicy marinade (even with Sichuan peppers) yet the fruitiness to enhance rather than fight with the hot spices. The next time you’re enjoying Asian food, remember that the perfect wine pairing can help you create a zen-like meal. The first recorded Chinese restaurant in the United States territory, called Macao and Woosung, opened in San Francisco in 1849, according to the Smithsonian Institute. Its founder, Norman Asing, developed what was the first Chinese all-you-can-eat buffet, for which he charged the princely sum of $1, which in 1849 would be the equivalent of about $29 today. The popularity of Chinese restaurants has certainly grown since then. 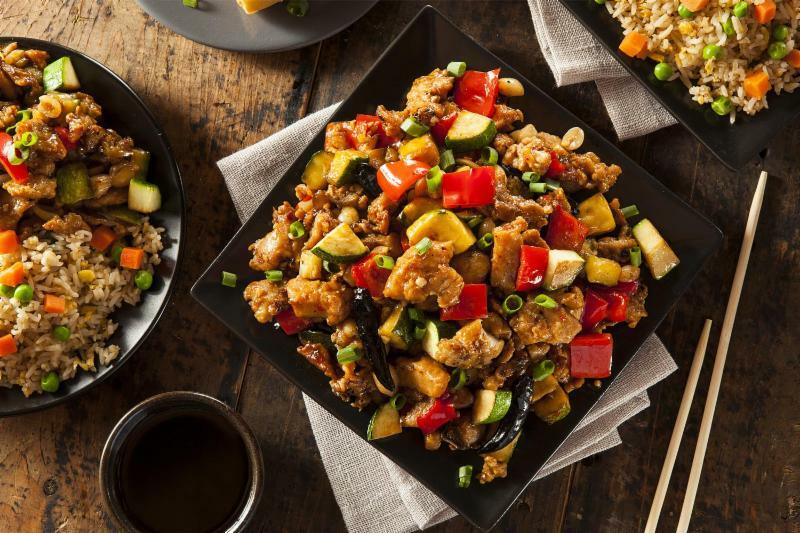 Today, there are over 45,000 Chinese restaurants currently in operation across the United States, according to the Chinese American Restaurant Association. This number is greater than all the McDonald’s, KFCs, Pizza Huts, Taco Bells and Wendy’s combined. Inspired to make your own? Try your hand with the ever-popular Kung Pao chicken and uncork a bottle of Riesling. The recipe includes a splash of wine in the marinade as well. Spicy chicken with peanuts, similar to what is served in Chinese restaurants, is easy to make. The ingredients reduce to a nice, thick sauce, and you can substitute cashews for peanuts, or bamboo shoots for the water chestnuts. 1. To Make Marinade: Combine 1 tablespoon wine, 1 tablespoon soy sauce, 1 tablespoon sesame oil and 1 tablespoon cornstarch/water mixture and mix together. Place chicken pieces in a glass dish or bowl and add marinade. Toss to coat. Cover dish and place in refrigerator for about 30 minutes. 2. To Make Sauce: In a small bowl combine 1 tablespoon wine, 1 tablespoon soy sauce, 1 tablespoon sesame oil, 1 tablespoon cornstarch/water mixture, chili paste, vinegar and sugar. Mix together and add green onions, garlic, water chestnuts and peanuts. In a medium skillet, heat sauce slowly until aromatic. 3. Meanwhile, remove chicken from marinade and sauté in a large skillet until meat is white and juices run clear. When sauce is aromatic, add sautéed chicken to it and let simmer together until sauce thickens. Serve with rice.